I read this article and found it very interesting, thought it might be something for you. The article is called Artsdesk: Radio Ga Ga – Gerard Byrne In Our Time and is located at https://www.totallydublin.ie/arts-culture/arts-culture-features/artsdesk-radio-ga-ga-gerard-byrne-in-our-time/. The airwaves are historically a contested sphere of ownership. When radio first made an appearance in the 1890s, it was a wild west populated mainly by hobbyists and the US Navy, who used it for time signals and weather reports. Entities using radio for official purposes at the time were increasingly irked by amateurs interfering with their broadcasts, and gradually regulations and licences were introduced to end the, as a 1912 newspaper headline described it, ‘Mob Rule of [the] Wireless’. The result of this pruning of voices on the airwaves was the birth of a medium that could claim to access a ‘unified’ public — one voice at a time, one collective audience. Now, in our age of Netflix, digital TV and podcasts, of on-demand and targeted content that caters to the whims of the individual, analogue radio broadcasts might just be the last medium that appeals to the notion of a ‘unified’ public. Gerard Byrne is speaking to me in his studio in Temple Bar Gallery & Studios. The room is filled with speakers, monitors, crates and boxes, drills, wires. It seems functional and transitory somehow — not a space to linger in. Byrne is discussing his latest work In Our Time, ahead of its Irish opening at the Kerlin Gallery this month. The video piece was commissioned for the 2017 edition of Skulptur Projekte Münster, a once-a-decade exhibition of sculptures in public places that happens in the town of Münster in Germany. The sprawling exhibition is the fruit of a controversy over a public sculpture that was installed in the town in the ‘70s, which the locals objected to. Skulptur Projekte Münster was conceived as a way to open out the conversation about public sculpture, public art, to the public. 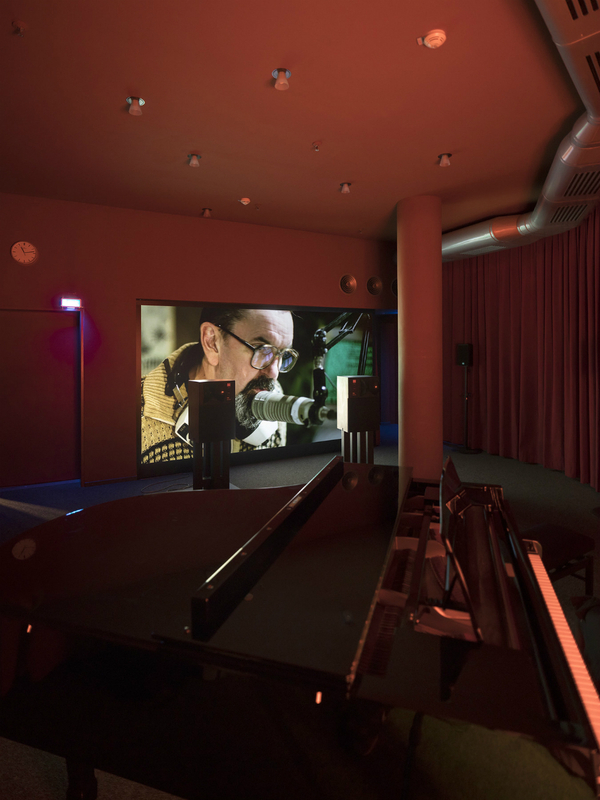 At this year’s exhibition, Byrne’s piece was installed in a basement annex in a public library in Münster. 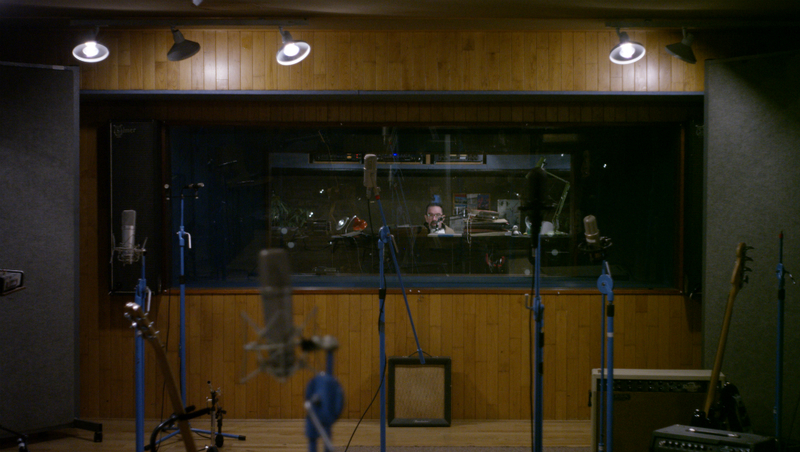 In Our Time is twelve hours of footage of a fictional radio broadcast, shot with actors in a mise–en–scène created by Byrne at Westland Studios in Dublin. 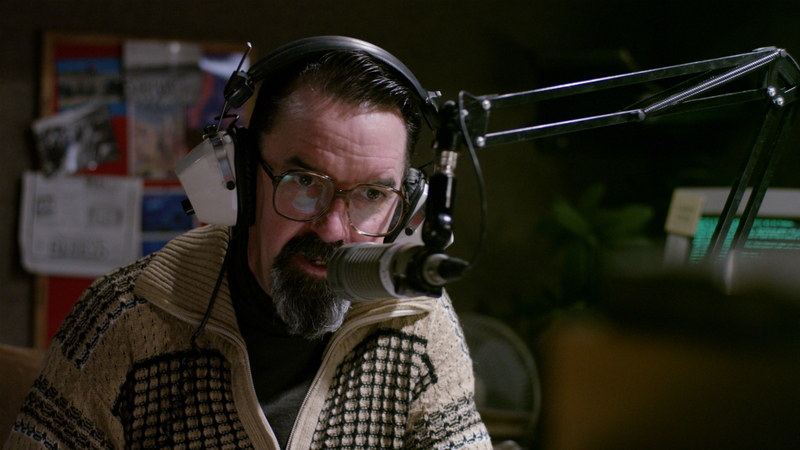 A DJ (played by Phelim Drew) spins tracks, gives weather bulletins, plays jingles and speaks to phone-in listeners from his soundproof booth, while in an adjacent recording studio a group of band members (so it seems) tinker with instruments and chat. The overall effect is something slightly off-kilter, out of joint with its time. Anachronistic props unbalance the general late-70s tone of the environment. The intermittently announced time of the radio broadcast is tied to the real-life time of the gallery, emphasising the real-time nature of terrestrial radio. Nostalgic hits pull the viewer/listener back to the decade past, resulting in a constant tugging of temporal awareness. Byrne generated the script for In Our Time through a mixture of collaged extracts from historical radio shows and some original writing. This approach seems to have two effects – it invokes the ‘perpetual present’ of radio while simultaneously conjuring the contemporary fractious public sphere that Byrne mentions. Through amplifying this ‘schizophrenic’ aspect of day-time radio by dislodging the usually repeated elements of a radio broadcast (the name of the radio station and the radio jingle change over the course of the broadcast), Byrne fragments the identity of the fictional radio station itself. There’s some poignancy in this, the sense of collective memory that’s invoked through nostalgic popular music and visual cues, contrasted with the fractured ‘personality’ of the radio station. In Our Time seems to be simultaneously a eulogy to the idea of social democracy and democratically managed public space, and a provocation to reconsider this idea. “The period we live in at some level is the legacy of the 1960s,” says Byrne at one point in our discussion, pointing to a decade when the sense of collective action and collective participation in public life and public space was strong. With his latest work, Byrne conjures a world where the loss of the idea of a unified public sphere results in a sort of cultural amnesia, a state where society is living from moment to moment in a perpetual present; a goldfish society, with no memory, and no legacy. Gerard Byrne’s In Our Time is in the Kerlin, South Anne Street, until January 20.